Location: Webster Street in Oakland, Ca Artist: Dyl. Done. Amend. 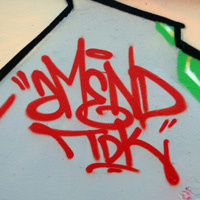 TDK. Dr. Jekyll and Mr Hyde. Location: Erie Alley @ Folsom in San Francisco, Ca Artist: Amend. TDK. Location: Foothill @46th Street in East Oakland, Ca Artist: TDK. Krash, Amend. Unknown. Photographer: Fuming Gorilla.